Inspired by the banners and signs at recent marches around the world, Really Cross Stitch takes all that anger, outrage and protest and puts it inside a pretty, decorative border. Along with some snarky commentary and general annoyance. 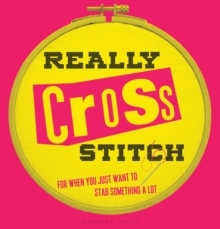 Featuring more than 40 truly original cross stitch designs, the book also contains instructions on techniques for new stitchers. Stitching for public protest is not new. First-wave feminists in the US and in Britain used needlework in their demonstrations and public protest lectures during the nineteenth and early twentieth centuries. Needlework and other handcrafts, however, declined throughout the twentieth century, with second-wave feminists arguing against "the oppression of the needle". In the 21st century however there has been a steep resurgence and many are turning to crafting, especially needlework, as an activist strategy. In Knitting for Good, feminist Betsy Greer makes this point strongly when she proclaims, "I think every act of making is an act of revolution."